Diabetes is a common disease that is affecting a million of people right around the world and the figure is rising every year. General nutrition guidelines should be followed to maintain blood sugar level to avoid complications. 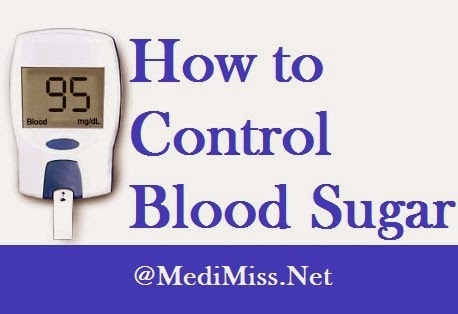 Controlling blood sugar is the key to staying healthy. First and foremost step is to know about the disease completely before starting to get ready for its cure. 4. Weight loss in type I. 5. Obesity in type II. 7. Decrease in healing capacity. 8. Cuts and blisters, red spots, swelling in the feet. Blood sugar should be tested on a regular basis. Records should be maintained of the blood tests, medicines and daily events. Patient should ask for a haemoglobin AIC test at least twice a year. Should do a regular blood pressure check ups cholesterol tests and other blood related tests. At least once a year have a dilated eye exam to check for eye disease, foot exam to check circulation and urine test to check kidney function. Reviews should be made with the health care provider. Most people think that sugar is only present in sweet foods such as chocolates, pasties or ice cream but in reality a large amount of refined carbohydrates such as white flours, bread, and white rice are easily converted into glucose as well. Person should avoid alcohol and smoking. Smoking damages health circulatory system which can lead to heart disease and poor circulation for people with diabetes. Diet plan should include fiber in form of raw fruits, vegetables, whole cereals etc. Wheat bran should be added to wheat flour. This will increase fiber in diet. Flaxseed and fenugreek seeds can be added into the wheat flour. Cholesterol-lowering oatmeal can be taken in breakfast. White meat such as chicken, Fish and shellfish are good for diabetics. Cinnamon, garlic, onion, bitter melon and guar gum are good to reduce blood glucose level. After consulting the concerned doctor the patient should indulge in a regular physical activity. For starters slow walking and swimming is advised. Yoga is also a good option. All the activities should include a stress free life. Few natural home remedies too can be tried at home to control sugar. 1. Boil 15 fresh mango leaves in 1 glass of water. Leave overnight. Filter and drink first thing in the morning. 2. Drink a watery juice of a small bitter guard (remove seeds) every morning.